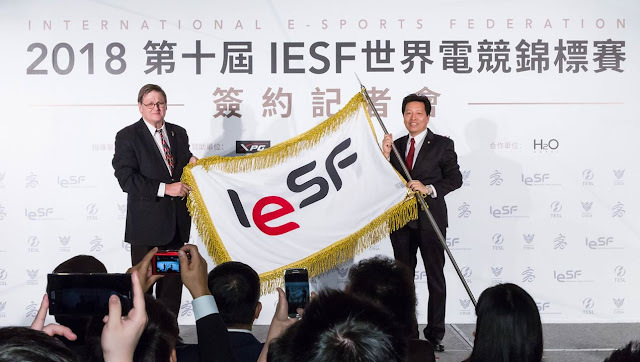 Esports, and other games : Road to Kaohsuing - IESF announces the dates of the 10th World Esports Championships. Road to Kaohsuing - IESF announces the dates of the 10th World Esports Championships. Colin Webster (IESF Board Member) handing over IESF's flag to CTESA in Taipei earlier this month. Mind Sports South Africa (MSSA) has participated in every IESF World Championships since the inception of such World Championships in 2009.
International Esports Federation's World Championships has grown from a mere 150 participants from 20 countries to 455 participants from 39 countries. On 18 April 2018, IESF released the dates of such World Championships being November 6th – 13th, 2018. The announcement of the dates follow a rather extensive site inspection of the venue at Kaohsuing City. At such site inspection IESF officials not only inspected the site, but also signed a MOU with Kaohsuing City. Thus, with all the pieces falling neatly into place, it looks as though it will be a truly memorable World Championships. StarCraft II: The full list of qualifiers. HearthStone: The full list of qualifiers. Hudson Park is on the rise. What is the role of the Esports Board of Control? DotA 2: The full list of qualifiers. League of Legends: The full list of qualifiers. Counter-Strike: GO - Full list of qualifiers. Drug testing for Protea Teams. Esports: Province to host National Team Trials. Free State umpiring course wrap-up. Jason Batzofin assists with IESF site inspection. Alasdair Donaldson steps up to the plate. IESF signs MOU with Kaohsiung City and CTESA. Qualifying for the Protea Esports team. Tekken 7 rankings for female gamers.